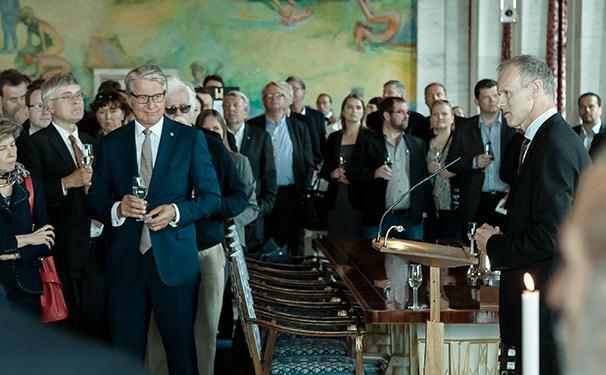 Oslo: More than 350 people turned out for the opening of Nor-Shipping 2015 at a special reception hosted by Oslo mayor Fabian Stang at the City Hall yesterday evening. “Norway has been a leading maritime nation for generations and I am confident that it will remain one in the future,” Sturla Henriksen, CEO of the Norwegian Shipowners’ Association said at the opening. After the opening reception, Pederstad also officially opened Ocean Talent Camp, which will be held on the City Square every day until Thursday. More than 9,000 students between the ages of 13 and 18, as well as 700 teachers, will visit Ocean Talent Camp to meet with companies and role models from the shipping and offshore industries. The program of activities happening during the event week is extremely extensive. In addition to the established high-profile conferences, the Nor-Shipping Awards, Ocean Talent Camp, the Young@Nor-Shipping events, there’s also the Waves of Change conference (organized by WISTA as part of Women@Nor-Shipping) and the Ocean Industry Podium, which comprises 24 different sessions to pick from. As for the exhibition itself, it will feature 1,030 exhibitors from 50 countries spread over 22,000 sq m.
Tonight sees the return of the famous DNV GL barbecue, although the weather looks like being quite a dampener on the sold out event which claims to be Norway’s single largest culinary event.